The Sign 360 app shows 3D avatars signing in LSF on centre stage with a level of high fidelity and fluidity in their gestures. This result is the achievement of 8 years of R&D from MocapLab’s Engineering Lab on full motion capture, including body, fingers, facial and eyes, areas of movement that are essential for the restitution of the finesse of sign language. 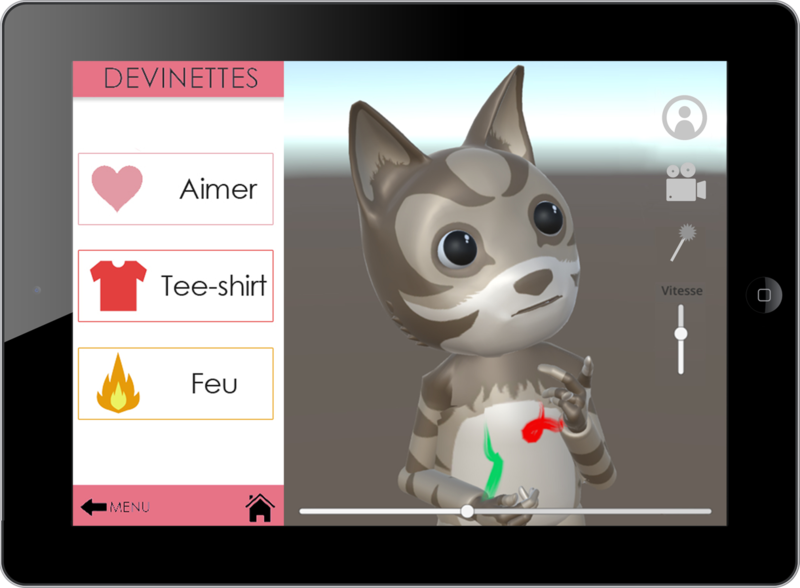 The app is based on a 3D innovative player developed specifically to allow visualisation in 3D and to increase the understanding and memorisation of the subtle movements involved in sign language. This 3D player allows the possibility to navigate around the avatar, and particularly to experiment with a subjective view. It can offer various effects that focus attention on the gesture itself and its components. This app aims to enhance the learning methods of movement. Beyond the field of sign language, the concept of the app is adaptable for any kind of movement learning (taï-chi, dance, professional gestures…). Presented for the first time at the Futur en Seine 2016 festival, followed by Sens Lab meetings and Moco 2016.